15'x15' minimum --- no maximum. 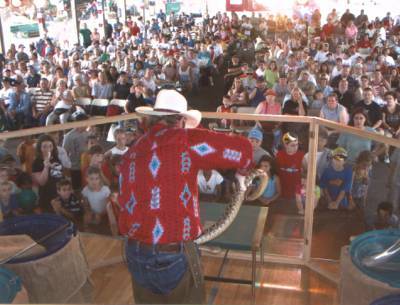 The Rattlesnake show is performed in an eleven foot specially designed octagon glass enclosure. Around the enclosure we prefer to keep a three to four foot buffer zone, which creates a better (unobstructed) viewing area for your spectators. The only thing you have to supply is electricity for our sound system and a show location. The West Texas Rattlesnake Show is completely self-contained, meaning that we supply all of the equipment necessary to perform the show, which includes our specially designed glass enclosure, all of the equipment necessary to safely handle the snakes and perform the show, and our own professional sound equipment including microphones, speakers and amplifier.